Discover the beauty of the ancient ruins of Copan and Quirigua on this overnight trip from Guatemala City! After a scenic drive in a comfortable vehicle, spend your first day at Copan in Honduras to explore its archaeological Mayan site. On your second day, venture to Quirigua, known for the tallest stela in the Mayan world. Learn from your expert guide about the significance and importance of these UNESCO World Heritage-listed archeological sites. Hotel accommodation, breakfast and hotel pickup and drop-off are all included! Leave Guatemala City behind and spend two days exploring Copan and Quirigua on this overnight tour! After pickup from your Guatemala City hotel, head to Copan in Honduras to begin your adventure. Located only 37 miles (60 km) from the Guatemala border, the ancient UNESCO World Heritage-listed city of Copan is considered a remarkable example of Mayan pre-Colombian culture. Follow your guide as you explore the huge complex here, consisting of several plazas and ceremonial temples. Admire the impressive detailed carvings on the more than 4,000 structures on site. 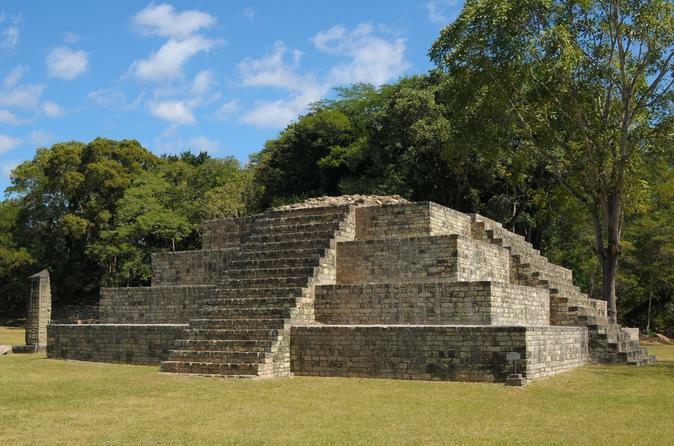 Then, head to the north side of the complex to visit the Great Plaza before seeing Copan's most famous monument, Altar Q. This intricate structure depicts all of the city’s 16 kings in succession. Enjoy lunch (own expense) in Copan before enjoying free time to explore at your leisure for the rest of the day. After breakfast on your second day, head out to the UNESCO World Heritage-listed Mayan site, Quirigua, located approximately 31 miles (50 km) outside of Copan. Quirigua is known for the Mayan world’s tallest stela. Visit Gran Plaza and admire the intricately carved stelae -- carved stone slabs or pillars used for commemoration -- and spot the tallest one, which rises as high as 32 feet (10 meters). Enjoy lunch in Quirigua (own expense) before heading back to Guatemala City.